In part one I talked about the things I love in comics and graphic novels, but also some of their failings. 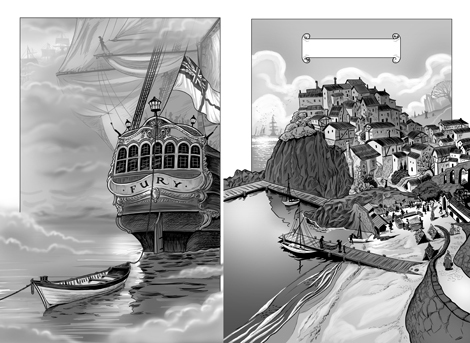 So now I’ve set myself up for great expectations with my hybrid illustrated novel “Monkey Boy” – which I would describe as “Blackadder” meets “Hornblower” with pictures. Like any book, “Monkey Boy” came together from a whole bunch of influences and ideas, but largely a lot of my books are formed by the desire to draw pictures of a certain subject. In the case of “Monkey Boy” this is was my desire to illustrate something from the era of the Napoleonic Wars. I’m really attracted to the late 18th and early 19th century because it was a time of huge social change in the Western World and formed a lot of the basis of modern society – but I also love the style and fashions. 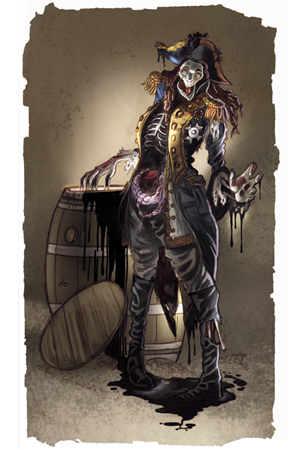 Like my work on “Faithfully Mozart”, this would include wonderful clothes and ornate architecture, but unlike Mozart, “Monkey Boy” would also include lots of blood and guts and gore and veins in yer teeth. I wanted to wow young readers with the amazing and thrilling world of 19thC naval warfare that I love so much. Apart from fun for me – the comic sections were also intended to make the book less daunting for young boys (especially the reluctant readers), who might discover a lifetime of enjoyment in reading and history if it were presented in a more exciting style. You see, as kid I loved “The Lord of the Rings”. I had it read to me when I was 7 and I read it 3 more times before I was 18 (and a few times since). But what I could never understand where Tolkien’s descriptions … a wall such-and-such long by so-and-so high, with flying buttresses and crenelations and god knows what else … As an boy (and even as an ex-boy) I cannot picture all that stuff without getting out a book of building terms to find out what all these things mean. From an entertainment point of view I personally find detailed environment descriptions hard to follow (it depends if the writer can clearly explain it). For me they stop the flow of the story and I just turn off as soon as I start reading super detailed descriptions (especially of architecture). What I prefer is the evocative hazy impression given by writers such as Katherine Kerr (I love her descriptions in the “Devery” series). What I prefer even more is pictures, like John Howe’s brilliant visions of Middle Earth. So, with my 10 year old self in mind, I wanted to “Monkey Boy” to do away with descriptions. There’s a lot of technical stuff on a Napoleonic warship that no one is going to understand on first reading – so away with them all! I would do it all in pictures. In “Monkey Boy” the words deal with emotions, character development, dialogue and plot. 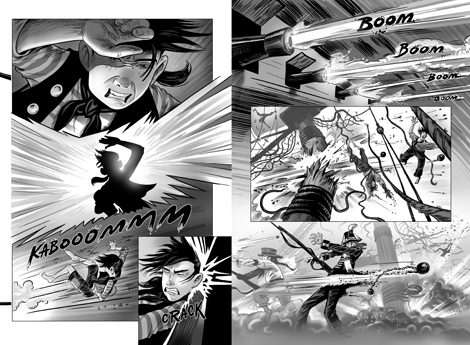 Meanwhile I let the pictures handle all the descriptions, the environment, the action scenes and the gory dead (oh, did I forget to mention “Monkey Boy” is populated with revolting ghosts lurking about – another thing I really wanted to draw – ha ha). The use of comic sections is also great for those ‘then suddenly…’ moments. The book also features maps and technical diagrams, but, as mentioned above, they only appear in the story when you need to know them – not something that you discover in the appendices and say “ohhh I wish I’d known this diagram was here when I was reading that chapter about masts and sails”. I had originally envisioned “Monkey Boy” to be like Brain Selzneck’s “Hugo Cabret” with big sections of individual page illustrations that you had to ‘read’ to follow the story. However I soon realized that “Hugo” was a fairly high-brow format for my type of audience and unfortunately deadlines and production budgets wouldn’t cover a 700 page book. I still wanted to retain the wordless images so that you didn’t rush through the comic pages, but again I have discovered that for the age and audience of a junior fiction book I really needed sections of text in my comics to have a nice flow joining novel to comic sections. I have still tried to keep my pictures as free of text as possible – and most importantly that each artform compliments the other. 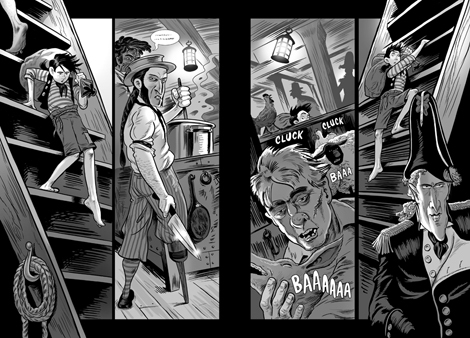 When our half-sized hero first comes aboard his new home (a great warship) the scene is told in 7 pages of comic as we descend into the darkness of the lower gun decks. Scholastic have been brilliant in accommodating my original vision and have allowed me to run with it. Hopefully you’ll all like “Monkey Boy” too. With commercial success I’d love to complete a second hybrid novel to go with it. “Monkey Boy” is out July 2014.